Gogi is Nigar Nazar’s mouthpiece. A cartoon character, Gogi sounds off on every domestic issue under the sun. Born in the ’70s from Nazar’s pen, the ageless Gogi has done the rounds of newspapers, magazines and TV channels in Pakistan and abroad. Nazar describes her as the symbol of the enlightened, energetic and adventurous Pakistani woman who refuses to kowtow to authority and finds humour in the most trying of situations – not unlike her creator, Nigar Nazar, the first woman cartoonist of Pakistan and CEO of Gogi Studios. Q: What inspired you to address issues like social hypocrisy through an unconventional medium like Gogi, a cartoon character? A: I read a lot of comics in my school days – and I still enjoy reading comic strips in newspapers. I’ve always felt that the art of cartoons is an appealing and powerful medium, and when used tactfully, it can bring about a change in our social fabric. Q: What role do you believe Gogi plays in your readers’ lives? A: When she was appearing in newspapers, many women could relate to her. She was a source of amusement to her readers. I believe Gogi teaches you to laugh at yourself in the worst of situations. And we all need to do that. Q: Who are the majority of Gogi’s followers? A: I have been occupied with projects and storybooks for children for the past few years, so for the time being my readers are children. It’s nice to see the impact of these books on young children, especially the book on environment called The Garbage Monster. Children in public schools will soon be receiving schoolbags with eight fun books/comic books authored by me. They will be attending workshops in which they will be entertained with animated Gogi cartoon spots, live cartoons and tips on drawing cartoons. They will also receive sketchbooks and art supplies from Gogi Studios for this purpose. Q: Have you ever been attacked for your cartoons? A: Not really, but the sad part is that I haven’t received any encouragement either. For instance, the owners of the print media would rather use syndicated foreign comics instead of giving local cartoonists a chance. 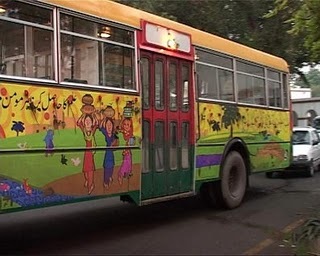 Nigar Nazar is a creative and most talented artist of Pakistan. 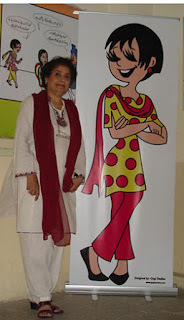 It is a achievement for Pakistan that it has a greatest and creative women cartoonist and govt should support her and introduce her on international level..